I doubt that very many people bother to think about how big the Andromeda Galaxy is in the night sky. Of course, the only portion of it that can be seen with the naked eye, or even through a small telescope is the bright central area. I did this to show the relative sizes of the galaxy compared with the Moon, which can easily be seen. The galaxy has to be really enormous to be as large as we see it, considering it's nearly 15 quintillion miles from here. That's 15,000,000,000,000,000​,000 miles (according to the U.S. standard!!! In the UK, a quintillion is a 1, followed by 30 zeros). And the Moon is 'only' about 240,000 miles from here. Post edited over 2 years ago by Allan.L. Nice, I had to look it up. The full moon has an angular diameter of ~30 arc-minutes whereas M31 is ~178 arc-minutes (the long way). So the full moon is ~16.9% of the diameter of M31 as viewed from earth. Does that sound right? That's what I found on the internet, too. I don't know what's wrong with my comparison, though... I took both photos with a 200mm lens. But in them, the Andromeda Galaxy doesn't appear nearly 6 times as large as the Moon. In mine, it's only about 3 1/2 times the size of the moon. Maybe I need to go back and see that I didn't reduce or crop something. I did take the photo of the moon a while back. Maybe I did alter it somehow. Anyway, I thought it was an interesting comparison - maybe not as interesting as it should be if I had made the AG 6 times as large as the moon, though. And having said that, I think there's probably a lot more of the Andromeda Galaxy that's too diffuse for our cameras or telescopes to see. Hey, Allan... Thanks for pointing out to me that the Moon appears too large in the combined image. I figured out what went wrong. While they were both taken with a 200mm lens, the resolutions were different. So, when I brought them both up in Photoshop, the Andromeda Galaxy image was reduced to 16.67%. Since the Moon was at a lower resolution, it only reduced it to 33.33% of the original size. Then, when I transferred the Moon to the other image, it came out too large. I just tried to redo the image by reducing the Moon to 16.67% before transferring it, but that made it too small! Maybe I need another image of the Moon to work with - taken at the same resolution. Or do a bunch of calculations to find out how much to reduce the Moon to make it the same scale.... Since I took that earlier image of the Moon with my 200mm lens, I haven't used it to image the Moon. All of my more recent images of the moon have been at 600mm or 850mm. After I redo it, I'll repost it as a correction... guess I'm stuck with the boo-boo above. Sorry about that, folks!!! I'm surprised that no one else noticed the discrepancy. This is the corrected image of the Andromeda Galaxy as compared to the Moon - at the same scale this time! For the Moon, this time, I used the same camera and lens at 200mm, and at the same resolution as I used for the galaxy. It made some difference, but not as much as I thought it would. The Andromeda Galaxy still doesn't appear to be nearly 6 times as large as the Moon. In this image, it's nearly 5 times as large. I suppose I didn't get the fainter, outer arms of the galaxy to show up... maybe... Anyway, this should have both at the same scale. Glad you figured it out, well done! Your image doesn't capture the full extent of the galaxy, the arms extend quite a bit further out, I did a quick paint mockup of what the full extent is roughly and then superimposed rings for the moon width based on your scale over the galaxy, it's close, but probably not 100% accurate. The line visualizes what the full width is roughly. Yeah, I'm sure I didn't get the fainter bands of the galaxy to show up. And I'm sure there are millions of individual stars associated with the galaxy that are far beyond your line or the circles. There is no edge of the galaxy to define it's limits, just the faint haze of stars that get further and further apart, until they fade from view. I've found images on the internet that show the faint haze extending beyond your line and circles. In this version of the comparison, the galaxy and the Moon were taken with the same camera and lens, and combined at full resolution, then cropped, and reduced for posting. 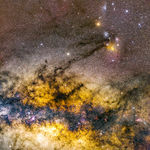 So, except for a tiny margin that I cropped from the stacked image of the galaxy, they are at the same relative scale. Maybe someday, I'll be able to stack a lot more images of the galaxy, and capture more of the hazy limits of the galaxy, but for now, I'm satisfied that this represents them at the same scale. The top one is the reworked image of the Andromeda Galaxy by itself. This is full-frame. And the one below is the composite that shows the image I submitted before, along with the one with the reworked image of the galaxy, and the moon at the same scale in both. It's plain how much of the faint hazy portions I was missing in the earlier posting. In this one, the galaxy is about 5 times as long as the moon's diameter, so I'm sure there is more to it to bring out. It should be about 6 times as large. The moon was copied to the image of the galaxy with both images at full frame and full resolution, and then reduced to the size of the original posting for this composite, still full-frame vertically, but cropped horizontally. I added the boxes to make it easier to see that they are at the same scale. This is tough to process because it's difficult to determine what's real galaxy vs. sky background haze or light pollution. I processed my own Andromeda in PixInsight. While PixInsight is a fantastic astrophotography image processing program, the one drawback is that 'masks' can only be generated by algorithm. You cannot using a mouse or graphics tablet & stylus to select a region. When I did mine, I had to produce a 'star mask' to isolate the stars and also a 'range selection' masks which uses relatively brightness intensities to try to identify the galaxy. The result (for me) was that I tend to be a tiny bit more conservative -- meaning I know my version of Andromeda doesn't quite extend all the way out to the edges of the disks. Basically... I know the challenges you would have faced trying to produce this image. One astrophotographer friend did give me a tip to help deal with light pollution. He mentioned that you can use the Digitized Sky Survey to download any section of sky you want. But the benefit of this is that these are images taken with sensitive cameras and in basically perfect conditions completely free of light pollution. So anything that gives off light in the image is actually in space and not a source from ground-based light pollution. I'm not quite sure what you're saying about light pollution with an image like this. The sky will be as dark as the light pollution will permit, and regardless of how bad it is, the outer haze of the galaxy will gradually fade into that light level. Light pollution will affect the entire area around a subject like this fairly uniformly - unless it's taken with a wide-angle lens that includes the sky over a town or other light source, and any difference between the surrounding sky and the hazy perimeter of the galaxy can only be caused by light from the galaxy. I don't think light pollution can contribute to what you see of the galaxy, only mask it and make it appear smaller than it would appear with no light pollution. The pictures that were used to make up the above image of the Andromeda Galaxy were take from a Bortle 1-2 transition zone in the Ouachita Mountains in Oklahoma. There was very little light pollution there, and virtually no discoloration of the sky in any of the mages, even with a 10 minute exposure. It was DARK out there, and COLD, too. (16 - 18 Degrees), and the humidity was very low, so there was little to no haze in the atmosphere for distant lights to polllute. This is a single frame from that session, right from the camera, without any enhancements at all, just reduced to post. For post-processing after stacking the 11 exposures, I used Photoshop and Irfanview. Total exposure time was 1 Hour and 10.4 Seconds. This image was taken with a Nikon D5500, 55-200mm lens at 200mm, 299.9 Second exposure, f:5.6, ISO 1000. The White Balance was set to 'Sunny', and the Noise Reduction was 'Off'.